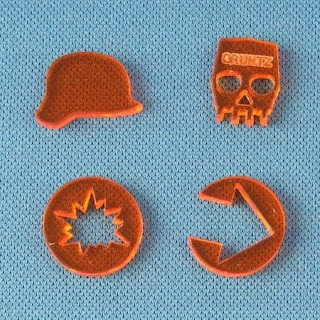 S6 Engineering have released the new Gruntz area effect, flamer/spray and vehicle/gruntz movement templates. You can pick them up directly via the S6 Gruntz order page here: http://www.s6engineering.co.uk/gruntz.html The tokens for use during the game are available in both a clear coloured version or opaque. I prefer opaque because you can very clearly associate the token with the appropriate condition. 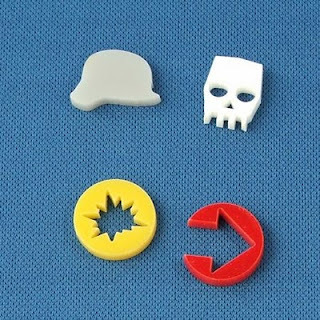 For example the white skull representing the "Waxed" condition is easy to identify compared to the yellow suppressed token. The option is there for those that prefer the fluorescent colours but I would suggest you go opaque for easier recognition on the table. The Gruntz flamer template has a mark line at 6 inches to represent personal flamers/spray compared to the 8inch full length for vehicle flamers. 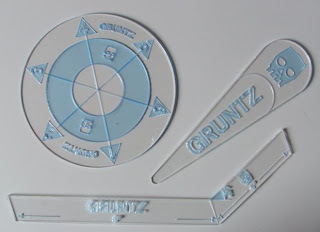 The vehicle turning template doubles as an easy ruler for Gruntz movement because all Gruntz squads move at either 4inches for a single move or up to 8inches if they complete a double move. 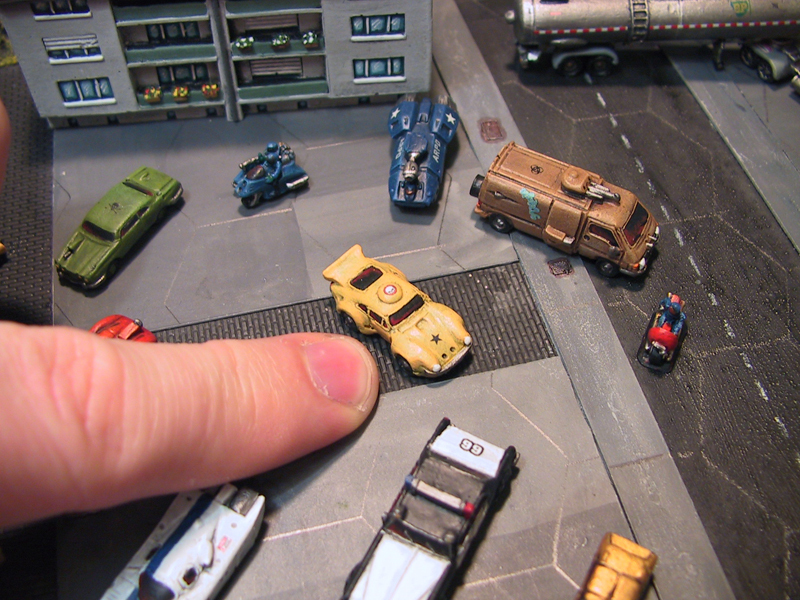 It is handy to be able to make use of the vehicle turning angle during normal Gruntz squad play, rather than relying on it just for the vehicle turning angle. The Area Effect template is also multi-role on the battlefield. 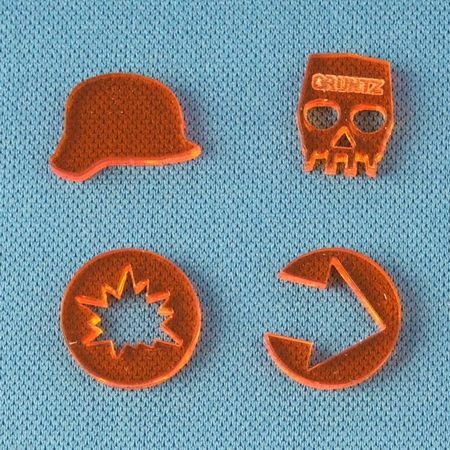 It can be used as a 2inch, 4 inch or 8 inch area effect template and also includes directly markings for a D6 Deviation roll. If your artillery fire is deviating, simple roll the dice to determine the direction, whilst holding the template over the original target. THose look very nice, and I really like the built-in multiple functionality of the templates. Do you have an email address that I can contact? 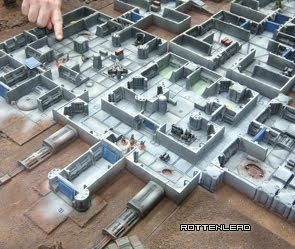 I am looking at sci fi tabletop in the Apr/May issue of Battlespace magazine. I just found these through tmp and in turn your game! It looks rather interesting could give me an idea of when I'll be able to buy it? I would like to view your Yahoo group but yahoo is being funny with me. Must contact S6 to see if I can get the flamer template and the turning stick separately as I already have the blast template. PS: Looking forward to the 'live' version of the rules.